April 6, 2019 – Bethlehem Central Middle School – 4:00 – 5:00. Huge thanks to Mike Klugman and Bethlehem Central School for hosting TRM 135. Bethlehem middle school is a great venue providing plenty of space for players and parents alike. The school accommodated us until 5:00. Discussed upcoming purchases including trophies, medals and vouchers. Trophies will be ordered with the same section names (Open, King, Queen, Knight, Bishop, and Pawn). Medals will be ordered in largest bulk quantity for pricing advantage. This year we purchased 300 vouchers for USCF membership. We have only sold about 200 memberships. This will lead to financial losses for TRM. We experienced a similar loss last year. Discussed option for the board purchasing fewer (200) vouchers, which would increase the price of each, voucher slightly but would limit TRM losses. We generally sell around 200 vouchers per year so there would be little financial losses to TRM. 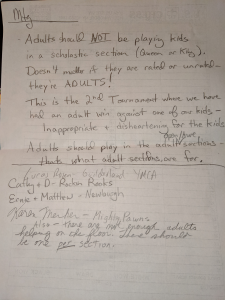 Discussed adults being allowed to participate in TRM tournaments. 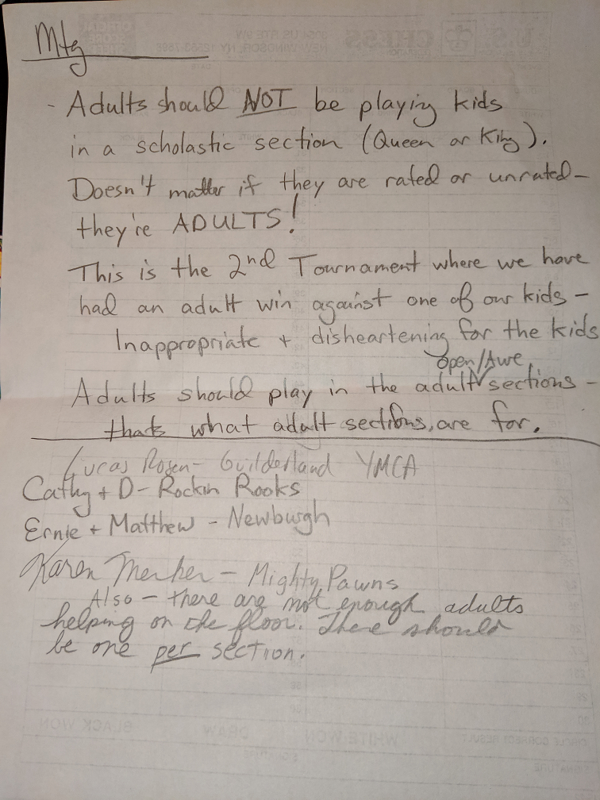 Adults will be allowed to play in Queen and King sections. No trophies will be awarded to winning adults. Top three children will get trophies. Consideration to change this rule (effective next year) will discussed at a future board meeting. Open format may change to longer format with fewer games such as G45 d10 for next season. We discussed a mandatory move rule to ensure that kids playing in the unrated sections are playing at the appropriate level. IF this change is made it will become effective for next year. If a player wins a trophy two times at one level they would be moved up to the next section (Pawn to Bishop, Bishop to Knight, and Knight to Rook) independent of age or grade level. Players that win a trophy in Knight two times may receive a complimentary USCF membership as a prize from TRM. The $5 no-show penalty has been very effective. There have been very few no-shows. The penalty will remain in effect. Instead of a blitz tournament, Jon suggested a simul, or a double simul depending on the number of expert players willing to play. One idea is a beat the TD simul with kids playing against our very own Jon Leisner! Schedule for next year to be set over the next couple of weeks. TRM 132 Chess Tournament was our largest tournament of the season with nearly 140 players. Liz G and her helpers from Albany High were great hosts. Albany High dedicated a large cafeteria to TRM players, a large cafeteria to parents/spectators, and a small quite room for the Open level players. Everyone had plenty of space. Thanks to all the great volunteers for helping to make things run so smoothly. Special thanks to Jon, Sreeni, Smita, Liz and Nitin. There was no official board meeting after the tournament. We collected $20 for no-show fees and $135 for USCF memberships (9 memberships sold). John Femia donated $5. Our very own TD, John Leisner, committed to co-sponsoring a tournament. TRM 131 Chess Tournament, went very well with nearly 100 players. Herman Calderon and his helpers from Giffen were great hosts. Herman provided seating areas for parents in the small cafeteria, a nice quit space for our players in the large cafeteria, and he opened the gym so players could burn off some energy. There was no board meeting after the tournament. We received $69 for 7 USCF membership vouchers. We received: $400 from Lakshimi Maddali and Freinds for tournament sponsorship, $200 from Alomgir Monsur for tournament sponsorship and a $5 donation from John Femia. TRM 130 Chess Tournament, November 3, 2018 went very well. Patrick Bergin, Paul Wilson, and their helpers from Oneida Middle School were great hosts. The school was a great venue with nice seating areas for parents, skittles in the library, plenty of space for our 90+ players in the cafeteria, and the gym was available for some basketball fun. There was a board meeting after the tournament. Attendees: Mary Ann Sorrentino, Walter Mockler, Sreeni Alampalli and Sandeep Alampalli (left early), Jon Leisner, Dave Finnerman, Nitin Obla, Newburgh Armory Unity Center. Board meeting started at around 4:00. We received $89 for 9 USCF membership vouchers. We received commitments from 4 individuals (Carlos Varela – March or April tournament, Alomgir Monsur, Paul Wilson – MLK, Dayanga Family) for $200 tournament co-sponsorship. Requiring players of winning section to move up. The board decided that for the remainder of this year coaches/club organizers will be asked (by the board) to encourage serious/competitive players to move up according to their performance. Ways to encourage participants to notate their games. Newburgh Armory Unity Center will provide TRM logo booklets at the next tournament, with a small note on the back of the booklets indicating they were provided by Newburgh Armory Unity Center. Players will be encouraged to use the books to go over games with expert aides. Volunteer experts will be available for post-game review (if there are volunteers, and there is space at the venue). There will be no more self-reporting of team scores. A TD helper will add the 4 highest scores from each team using SwissSys output at the end of round 4. Players are responsible for making sure their team name is properly listed on the pairing/ranking sheets. The team competition has not changed in any other way (still top 4 scores with tie-breaker determined by number of participants). Round one tends to be difficult due to repairing due to no-shows. Going forward we will track on-line registration no-shows and require $5 payment (if they do not send an email notifying TRM of their inability to play by 9:15 am the day of the tournament) at their next TRM tournament. The registration form and tournament specific campaigns will clearly state this rule. TRM boards for casual play will be set up in the skittles room (if there is a skittles room at a tournament). Casual games will be moved out of the tournament room and into the skittles room. Board meeting adjourned at 4:30. TRM 128 Chess Tournament, during the National Chess Day weekend, went very well thanks to all the great volunteers (there are too many to name but: Nitin, Rakhi, Sandeep, Sreeni, Brother John, Liz, Juhi, Cooper, Manasvin, Christine any many others! You were each instrumental in making today a success). Special thanks to Dwayne and the students from Albany Community Charter School for providing a great venue. New officers were announced at the beginning of the tournament: President – Mary Ann Sorrentino, Vice President – Christine Zhao, Secretary – Michael (Walter) Mockler, Treasurer – Brother John McManus, and Web Activities – Smita Iyengar. There was a quick board meeting after the tournament. Received $400 check donation each from Sorrentino family and Alampalli family for tournament sponsorship. Ernie Johnson committed to sponsor TRM 129. Received $63 cash for 7 membership vouchers. Past season board of directors meeting notes can be accessed here.